Confessions of a Book Addict: Anyone Want To Read and Review Huntress? Anyone Want To Read and Review Huntress? Ok. So I can't say this happens often, but sometimes I just don't click with a book.....at all. This recently happened to me with Huntress by Malinda Lo. I was very excited for this one and I fell in love with the cover, but as I read more, I realized that it wasn't for me. I struggled with the writing style and I just couldn't continue and please don't think it's because the main character, a girl, is diggin' another girl. That doesn't bother me at all; I was simply not feeling it. I realize that there are many of you that would love to read and review this book, so who would like my ARC? I would put it in my classroom, but this books says for 15+ and that is just a little too old for most of my students. 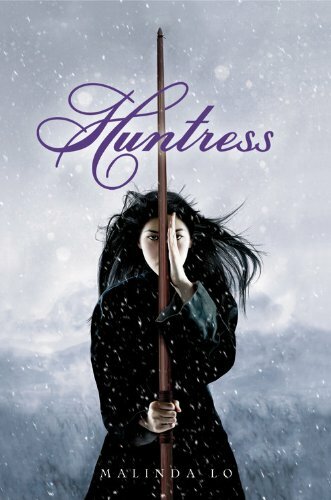 Let me know that you would like to read and review Huntress on your blog by filling in the form below. The deadline is April 4th and US/Canada residents only, please. Also, be sure to refer to my giveaway rules. I hope Huntress finds a good home! I am struggling with this one too and I don't remember having that issue with Ash. I haven't gotten very far so I will give it another try next week. Hey, it happens. It's really great that you're giving someone else a chance though! Yea, I know what you mean, it happens sometimes. Thank you so much for the amazing opportunity~!